Seventeen original cowboy poems plus intro, recorded live in concert. Stories of the people and land of the American West. 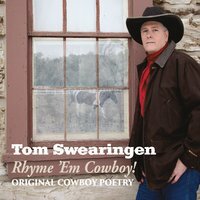 Tom Swearingen tells stories of the people and land of the American West through original cowboy poetry and song lyrics. Tom is a horseman whose writing is often inspired by his own experiences and observations from the saddle. He is two-time winner of the National Finals Rodeo Cowboy Poetry Week Contest, and has been nominated by both the Western Music Association and the Academy of Western Artists as Male Cowboy Poet of the Year. Tom’s poems have been published by the Center for Western and Cowboy Poetry, featured in Cowboys & Indians Magazine, and recognized by such organizations as the National Cowgirl Hall of Fame.